Aside from the musicians from the late 1990’s Sam Rivers crew, we’re not sure that anyone has appeared in three cm5 shows inside the interval of one year. Cortex bandleader Thomas Johansson and saxophonist Kristoffer Alberts are about to enter our record books under this category. Last October, Cortex captivated the attendees at Gallery At Avalon Island. Just two or so months back, Johansson and Alberts stood front and center of that thirteen-strong new music mob, Large Unit, submitting new language for, well, ostensibly a jazz orchestra. 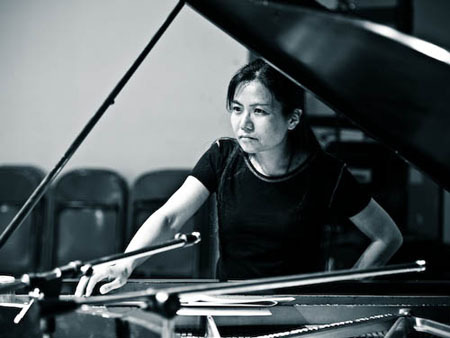 The new album from Satoko Fujii’s Orchestra Berlin is reviewed. JazzTimes review’s the new releases from Nik Bartsch’s Ronin and Sonar with David Torn. Skirl Records has a new release coming out from Sean Moran. Source: San Francisco Classical Voice. Calling John Zorn prolific is like describing the Pacific Ocean as vast, or Picasso as protean. It’s true as far as it goes, but it really doesn’t paint an accurate picture of the saxophonist’s scope as a creative force. Even when his Tzadik label releases several dozen CDs documenting his music over the course of a year, the blithely uncategorizable New York composer has zigged or zagged to yet another project, another body of tunes, another collaboration.